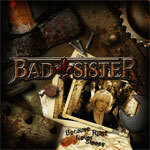 Probably better known in their native Germany and surrounding Europe, Bad Sister dates back to turn of late 1980's into the 1980's when they cut two studio albums. This female fronted band is steeped in the best European melodic hard rock of the 1980's. Because Rust Never Sleeps is a comeback album of sorts, and travels the familiar territory from AOR to melodic hard rock. The album is well produced with accomplished performances by all players. Yet, with this said, the whole of Because Rust Never Sleeps is unbalanced in the favor of guitar driven songs, thick vocal arrangements, and Suzie Lohmar lead vocal performance. Lohmar carries most songs well, yet seems to strain throughout sounding worn with age or too much whiskey. As for the tunes, as alluded to previously, most are lively guitar driven rockers which, thanks often to the superb rhythm section and terrific fret work, are quite entertaining and deliver some fireworks. Most notable are Rocky Road, Heat Of The Night, and the best track, Zone Zero (thanks mostly to the fact that Lohmar is not doing the lead vocals). Generally, the rest of Because Rust Never Sleeps consists of a mix of ordinary ballads, AOR, and melodic hard rock. These songs are sabotaged by the lead vocals only to be saved from within by the guitar work, vocal arrangements, rhythm section or some combination of them. With these things in mind, Because Rust Never Sleeps is a vigorous and entertaining, though sometimes lackluster and average, comeback for German melodic rockers Bad Sister. There are some real gems of true melodic hard rock greatness here which makes Because Rust Never Sleeps worth exploring. Because Rust Never Sleeps is a vigorous and entertaining, though often lackluster and average, comeback for German melodic rockers Bad Sister. There are some real gems of true melodic hard rock greatness here which makes Because Rust Never Sleeps worth exploring.